Samoa Joe, Paige, Bayley, Riott, Backlash, Steamboat, Andre, Gibson, Titus, Sasha, Impact Rating, Bucks, WWE Clips - Sat. The YouTube subpocalypse is for real and my YouTube channel could use your support. I need 1,000 subscribers to survive and it's at 621 subscribers right now, an increase from when the bad news broke, but I still need 379 more. While the revenue generated is small compared to a Game Grumps or a NoDQ it's still very much necessary to keep our operation running. Please subscribe to Mistah MegaManFan and help me out! 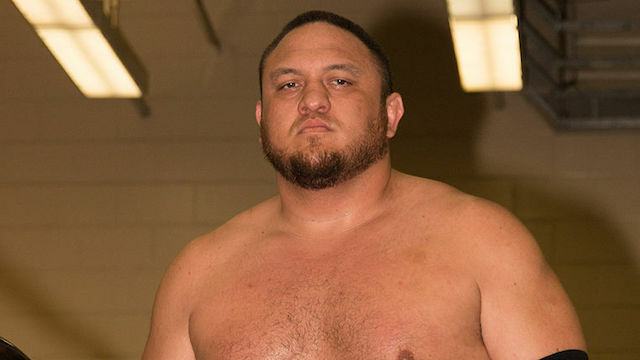 Here Samoa Joe says he's not surprised fans cheered for him over Roman Reigns: "I don't think it's anything I didn't expect. I'm not out there lying to anybody. I'm out there telling the truth. You may not like the way I deliver the truth, you may take umbrage with the way I handle most of my conflicts, but that's the way I do business. If we're in a fight, we're in a fight all of the time. It doesn't stop just because the cameras are off. I'm going to come at you however I can. Roman knows how I play this game and its nothing he or the fans shouldn't expect. It shocks me that people are still shocked that I behave this way." In this interview Paige talks about her career shortening injury: "When the accident happened in the ring, I lost all feeling in my legs and my arms. It was literally the most terrifying experience of my life and I never wish that upon anyone. It was so scary. I literally thought, 'I'm done. I'm going to be in a wheelchair now. This is it. I pushed myself too much.' I really did. I feel like I pushed myself too hard to the point where my body was done. My doctor said maybe (I could wrestle again) in 15-20 years time; but, I don't think I want to wrestle in 15-20 years time." In this interview Ricky "The Dragon" Steamboat says he was unaware of heat between Andre the Giant and Macho Man: "To tell you the truth, I didn't know anything about that until I saw the documentary, Andre's feelings towards Randy. I don't know if he developed that prior to our WrestleMania 3 match or did it come after? I don't know. They didn't give a time frame for Andre's feelings towards Randy in the HBO documentary. I do know Randy liked to break out the baby oil as referenced by Hulk Hogan in the film. I know he liked the shine. He liked to look good, but most of us did use baby oil anyway, put on a little bit. It accentuates your tan." Here Zack Gibson talks about working WrestleMania Axxess this year: "Without trying to sound cocky, any performer has to have confidence in themselves. WWE has always been my end goal, and it's always been something that I've wanted to achieve and I'm not going to take no for an answer. With that being said, when you finally do get that call to do a show, it's still unreal. It's still a surreal experience. I've been knocking on WWE's door for quite some time now." On Sunday Titus O'Neil and Sasha Banks will attend a Wildlife Warriors function in Los Angeles, a charity set up in honor of the late Steve Irwin. Here the Young Bucks says WWE isn't even a goal any more. Nick: "It's always going to be a question, no matter wha. No matter how big we get it will always be a question that lingers on our career... it will always be a question: the way we are going now, we could retire in five years." Matt: "We could literally quit tomorrow and do something else because we have enough saved at this point." New WWE related clips are available below. Here Nia Jax says she wants to face Ronda Rousey: "Most definitely I want to get in the ring with Ronda Rousey,” Jax said. “It would be a clash of the titans, something that would be a crowd pleaser. You’ll have to wait and see for that."